I can see why you have been so busy!!!! How fun! I enjoyed your postcard, too--have a wonderful Fourth! Wonderful! I think there is potential here. Happy PFF! Great idea - to act these postcards. If you make it to the Edinburgh fringe we all at PFF should come. Great idea. Wonderful way to use the postcards. We do something similar with works of art at the museum ...kid get to write a story, or tell a story based on what they see. Gets them thinking! Happy PFF! It would make an excellent fringe performance! It would be a great performance of intrigue and mystery. I wonder if "heaps of money" will be waiting for you too. Wish I had been there for your performance. Reading postcards publicly on a houseboat! What a quirky adventure! I would so love it once I was over initial nerves! Interesting! 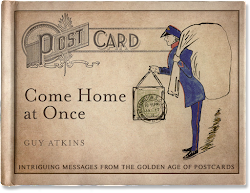 Also, what if YOU, guys and gals, create and write such postcard messages/poems/haikus? What if you read messages from postsecret.com? What if you show your maximum cards, and comment on them as visual metaphors? Great potential for entertainment and intellectual stimulation.